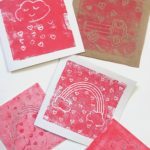 Printmaking is always fun with any age group. 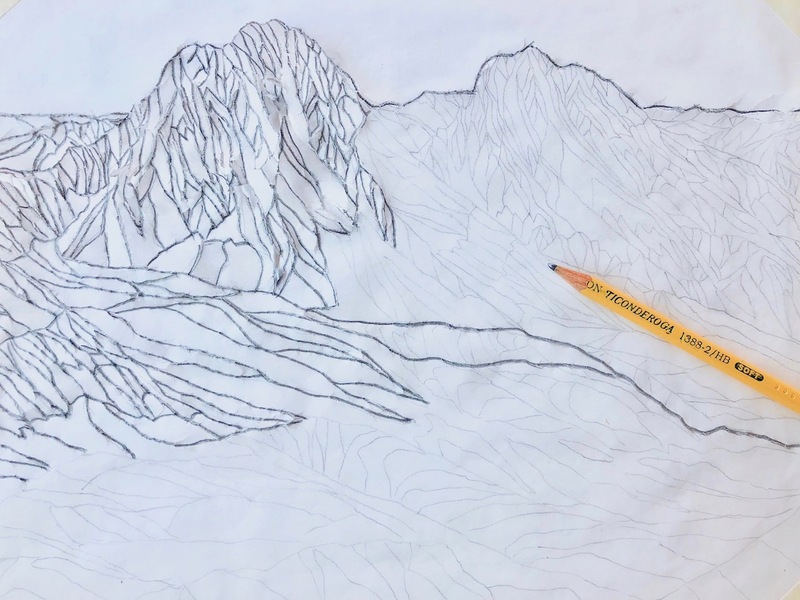 As older children grow increasingly critical of their drawing abilities they sometimes get frustrated and often end up reluctant to engage in art activities. 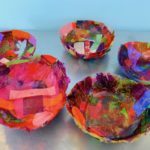 Foolproof and playful art activities can be a great way to help older children develop confidence and grow more accurate drawings skills. 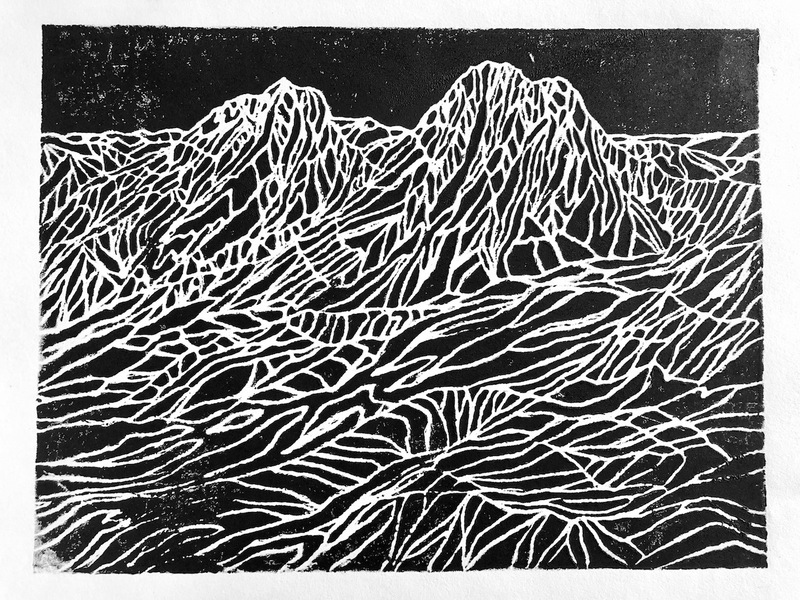 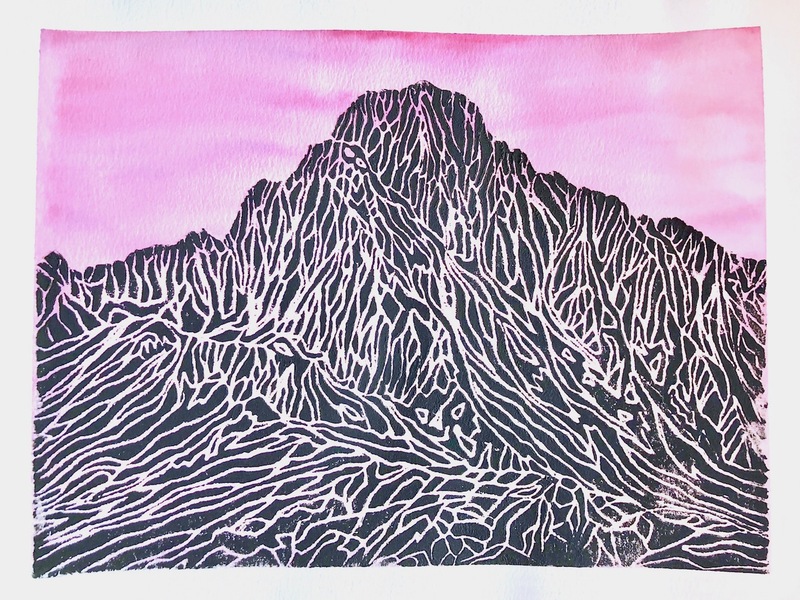 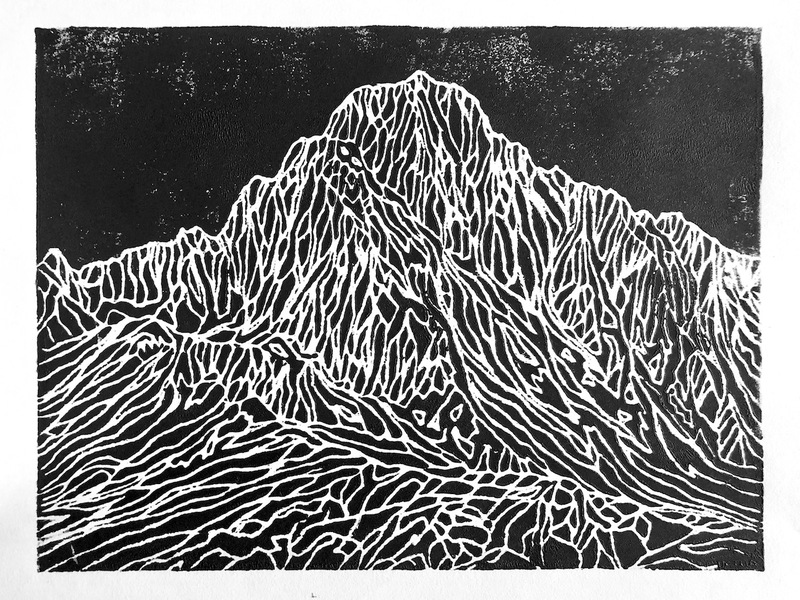 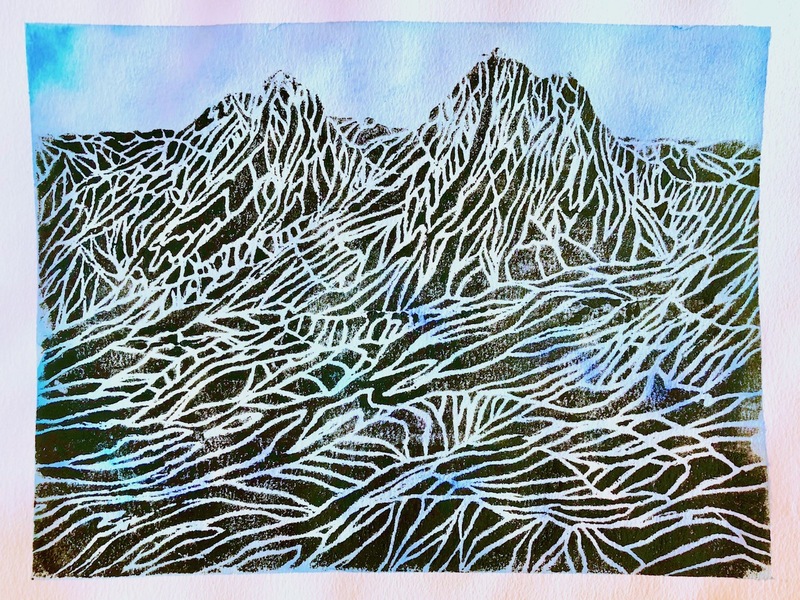 In this mountain printmaking project they can attain the realistic look they so much desire without major frustration or disappointment! 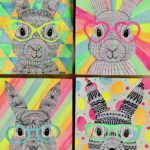 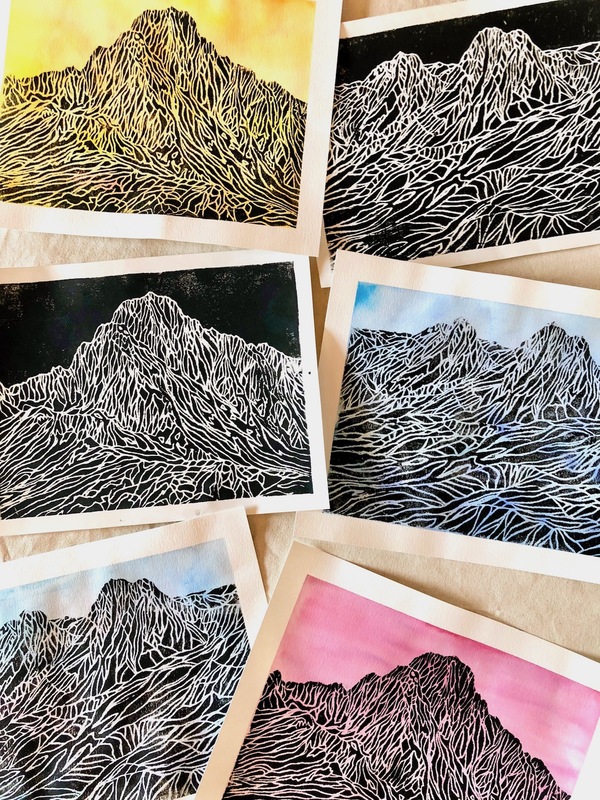 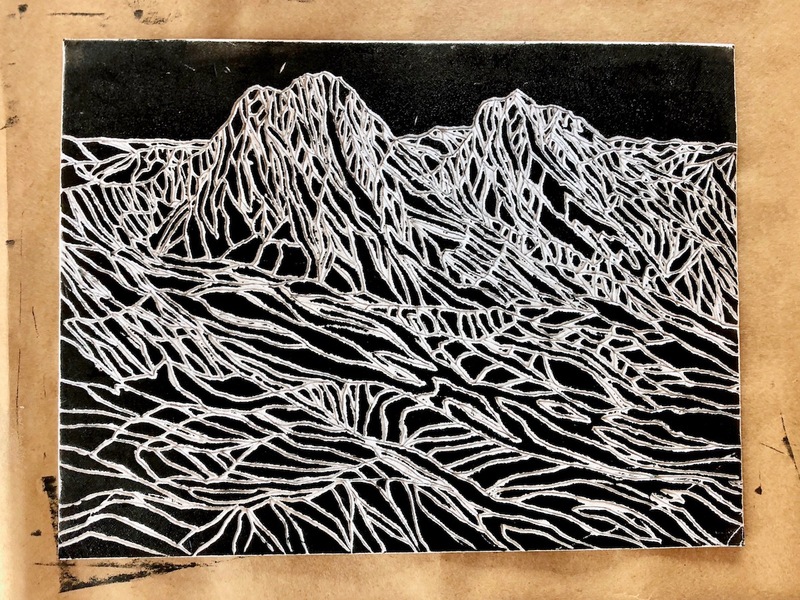 You can make wall prints and calendars from your prints or offer this printmaking project as part of an artful outdoor exploration week, with or without tracing. 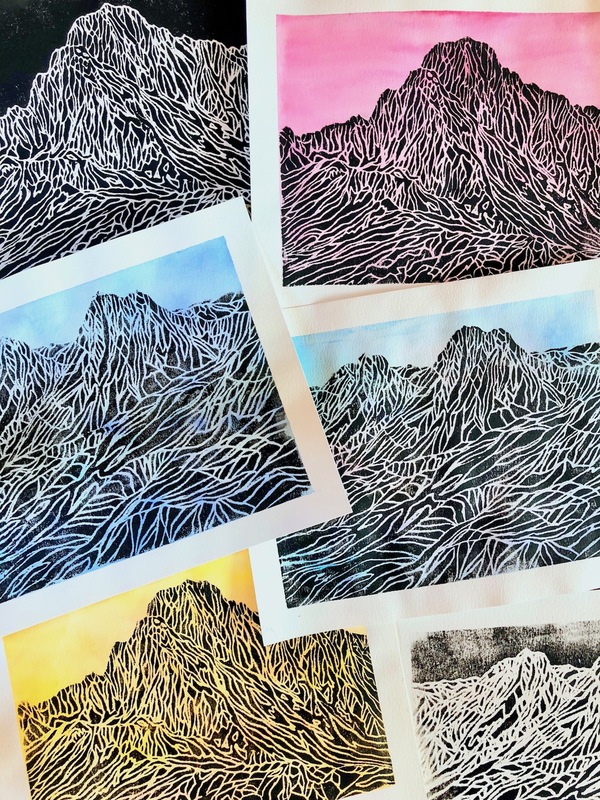 Make sure to check out our other playful printmaking projects here and here. 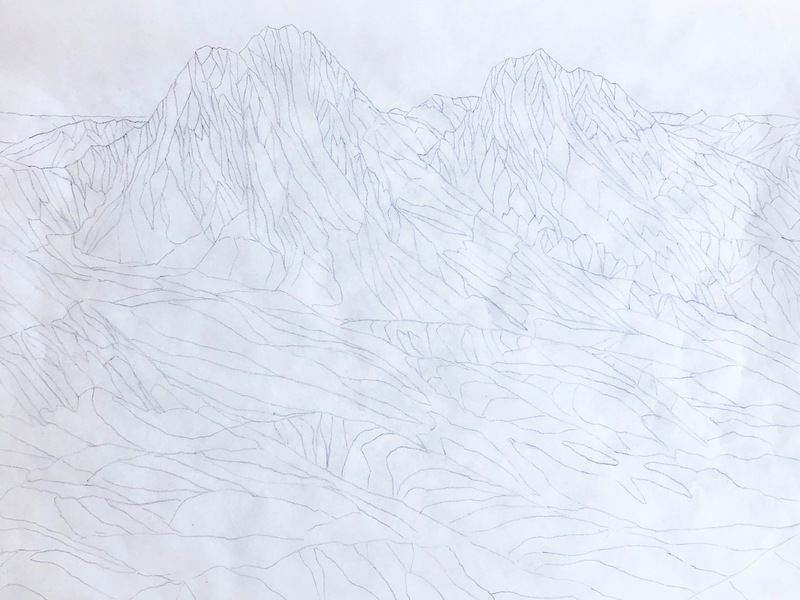 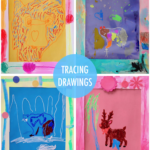 Tape a piece of transparency paper on top of your chosen picture and start tracing the lines. 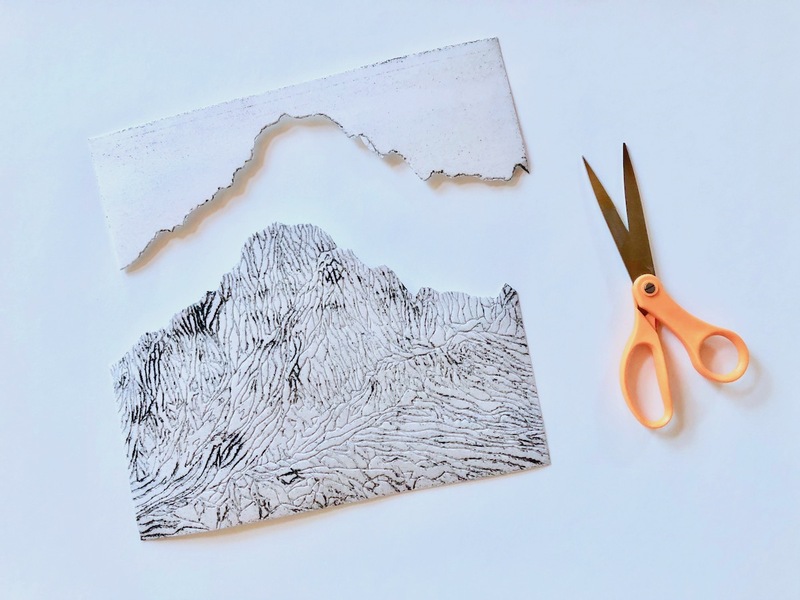 Avoid drawing very small details that might disappear when printing. 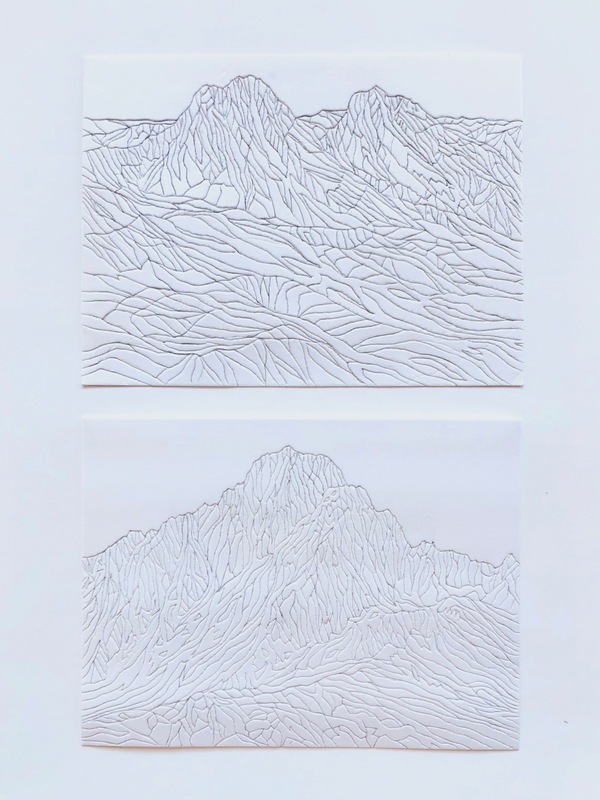 Feel free to look under the paper in case you can’t see all the details or invent your own lines to the existing one’s. 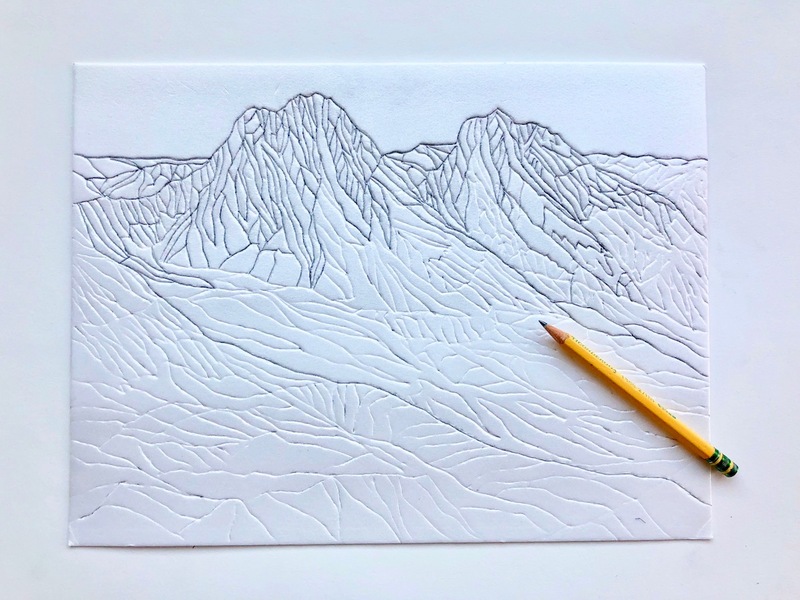 The lines you are drawing will show up white when printing, everything else will be black. 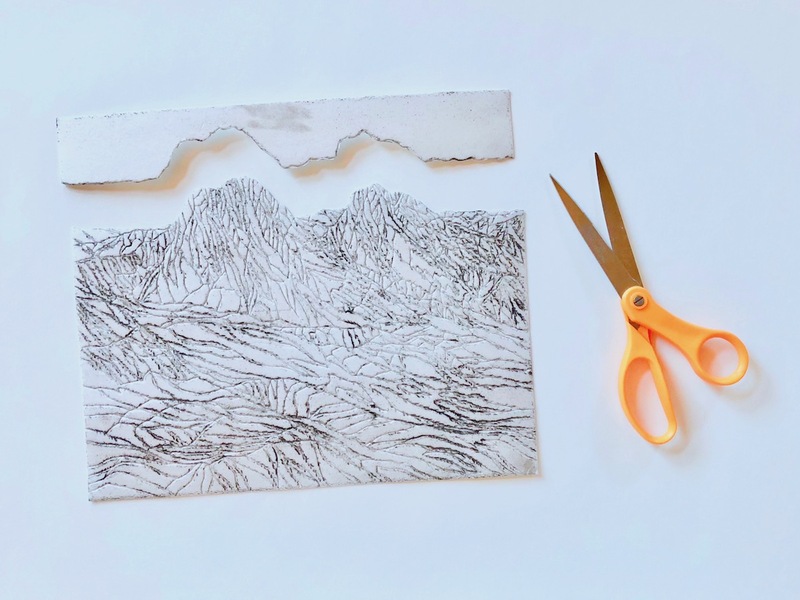 To frame your art tape a border around your paper. 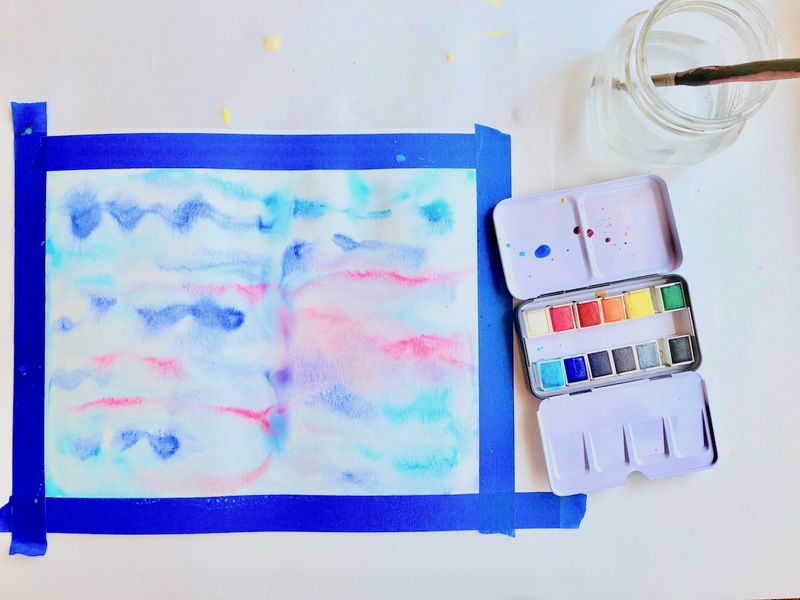 Use a paintbrush to evenly wet your paper with water. 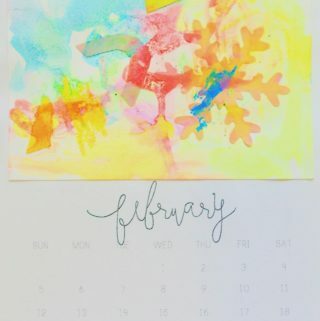 Give your paper a watercolor wash and experiment with beautiful wet on wet techniques. 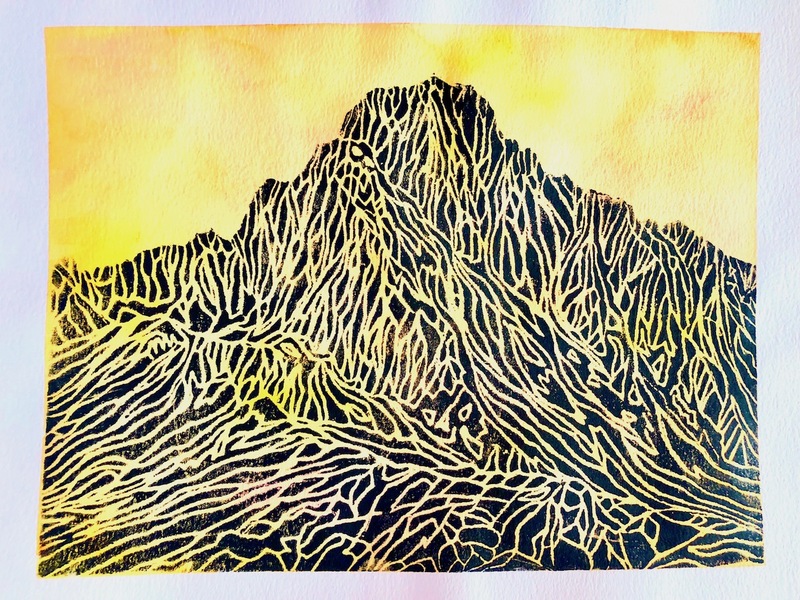 Introduce the concept of a gradient wash and how to add small amounts of color so the pigments feather and mix. 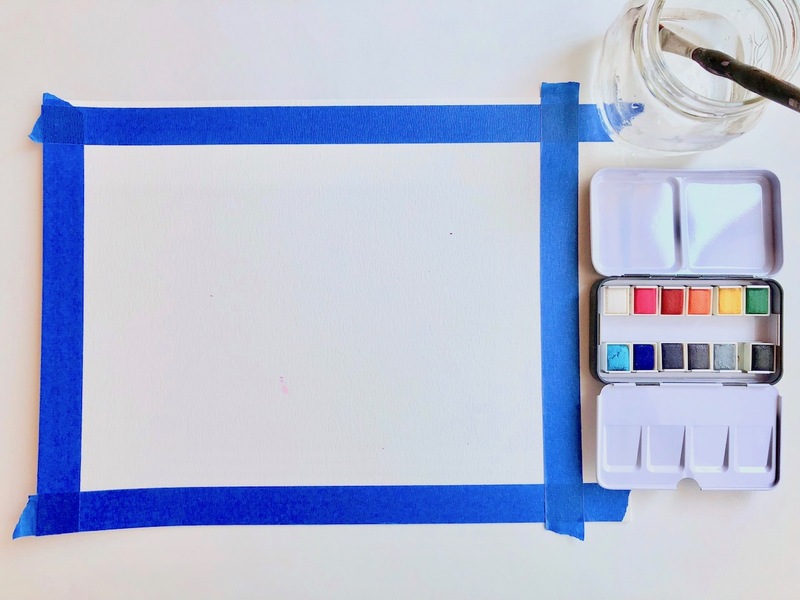 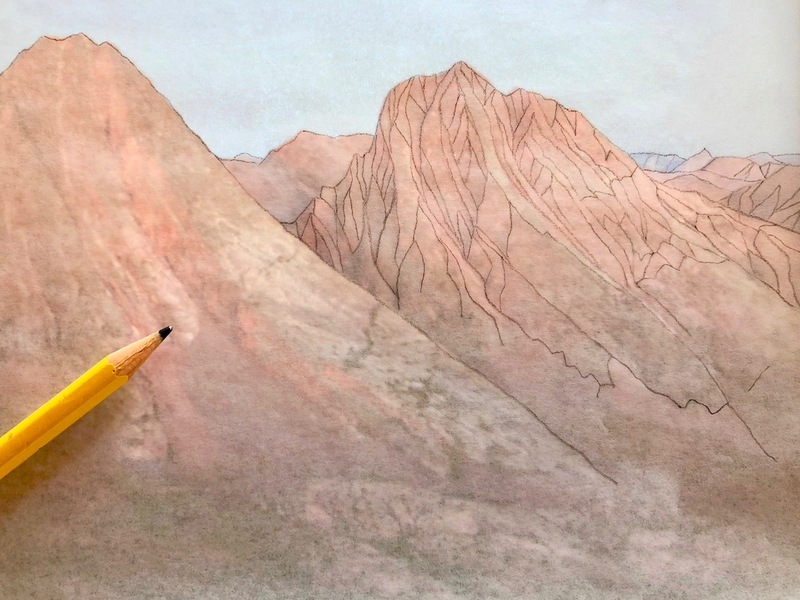 In case you’re unfamiliar with watercolors here’s some good essential watercolor techniques. 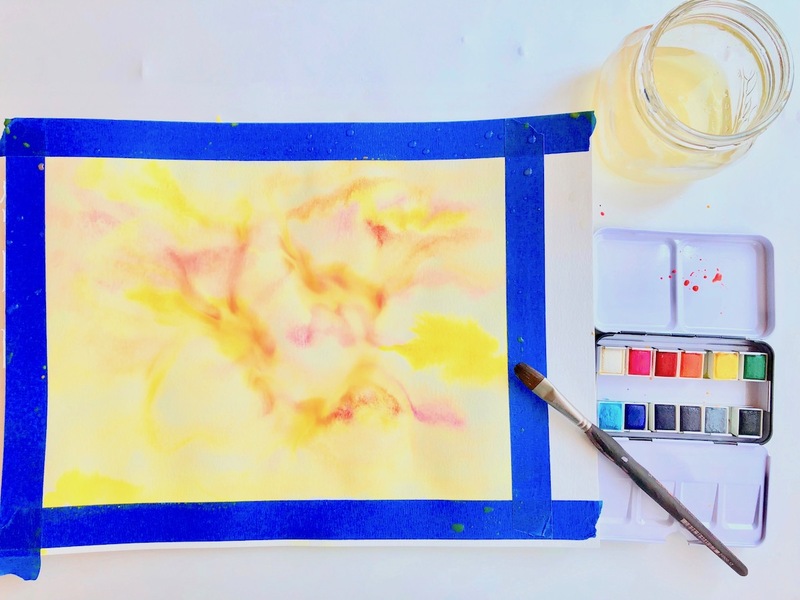 To make liquid watercolors, mix some water with just a few drops of liquid watercolors until you like the hue and intensity of the color and add a thick paintbrush to each glass. 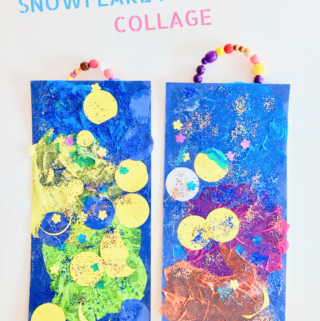 Tell the children to use one color at a time and ask them to put the paintbrush back in it’s glass which keeps the colors clean and vibrant (we actually used our new sets of Prima watercolors but liquid watercolors create a more even design and are less complicated to use). 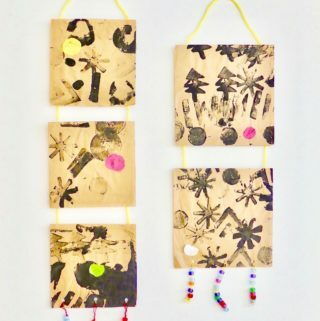 Allow for the papers to dry while you transfer your design. 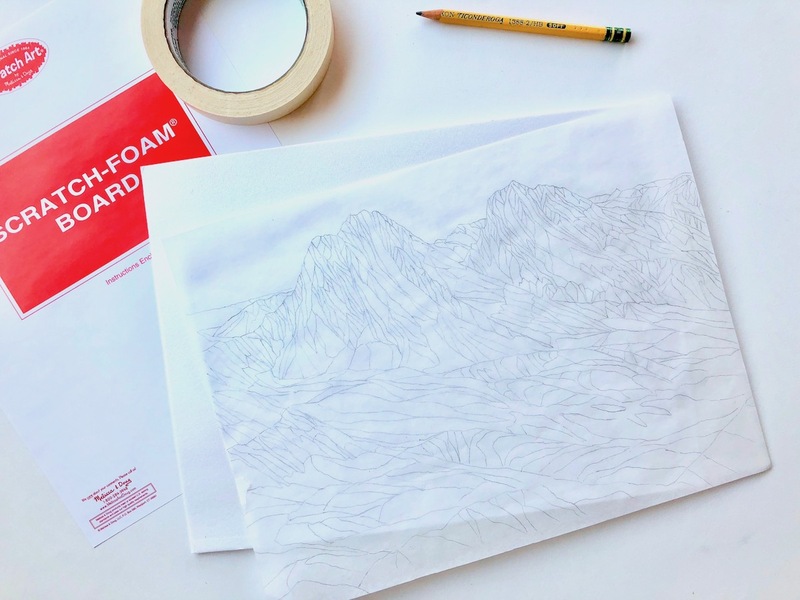 Tape your drawing onto either side of the Scratch Foam and retrace your drawing using a dull pencil, pressing down rather hard. 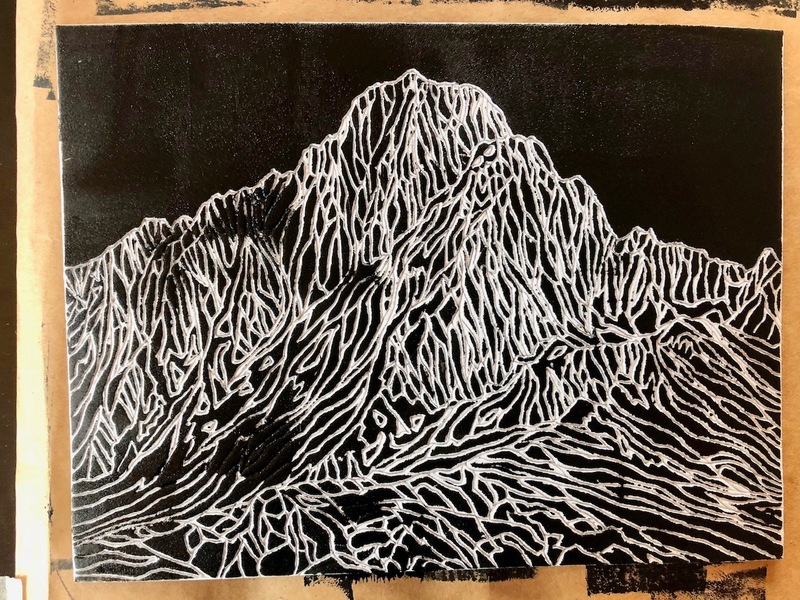 The lines you are carving will show up white when printing, everything else will remain raised and will show up black. 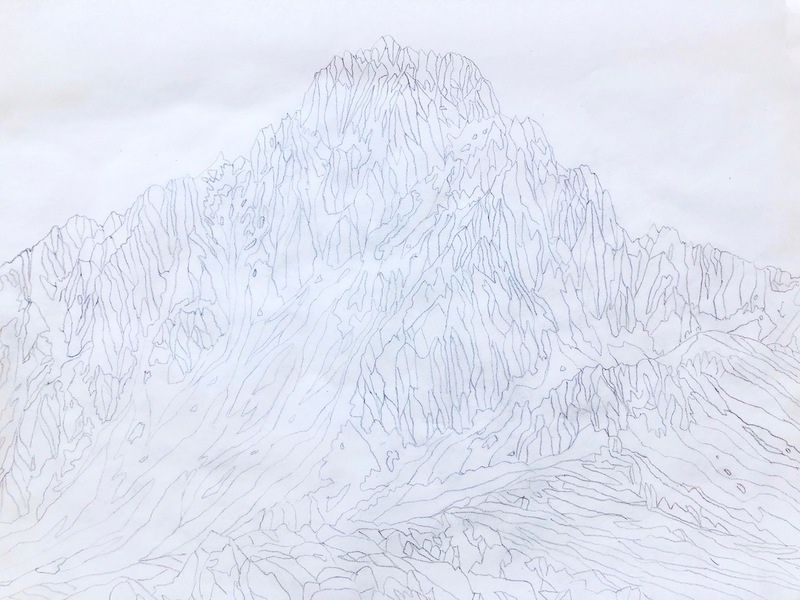 When done, remove the tape and tracing paper. 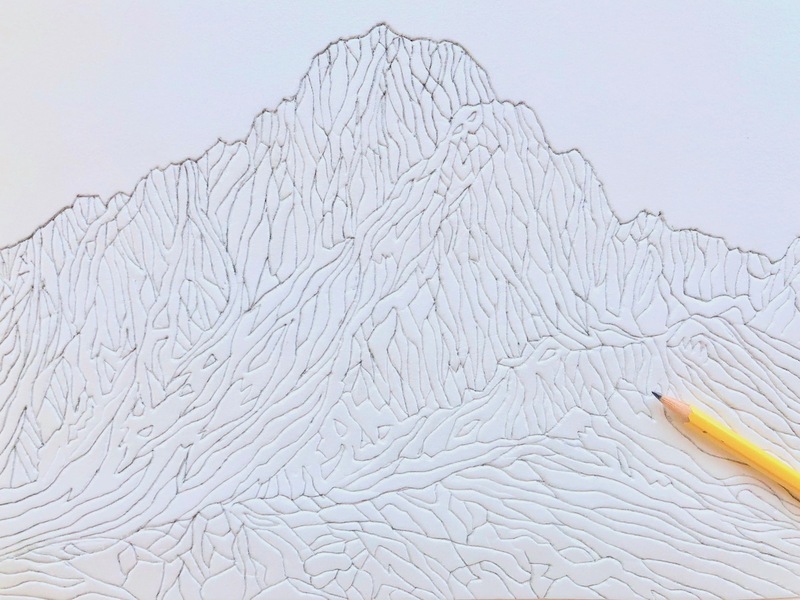 Remove the drawing and retrace it once more directly on the Scratch Foam, creating deep grooves. 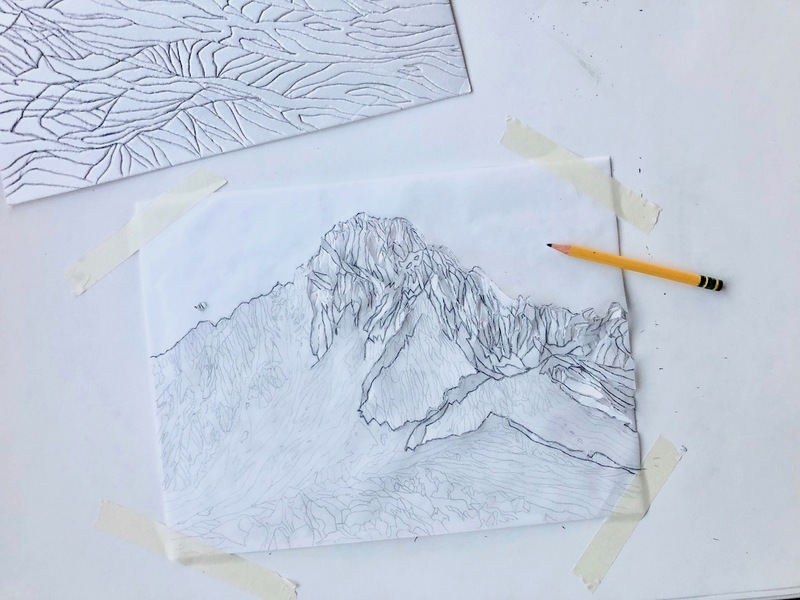 Point out where children have to trace the lines once more to make them deeper so they will show up in their prints. 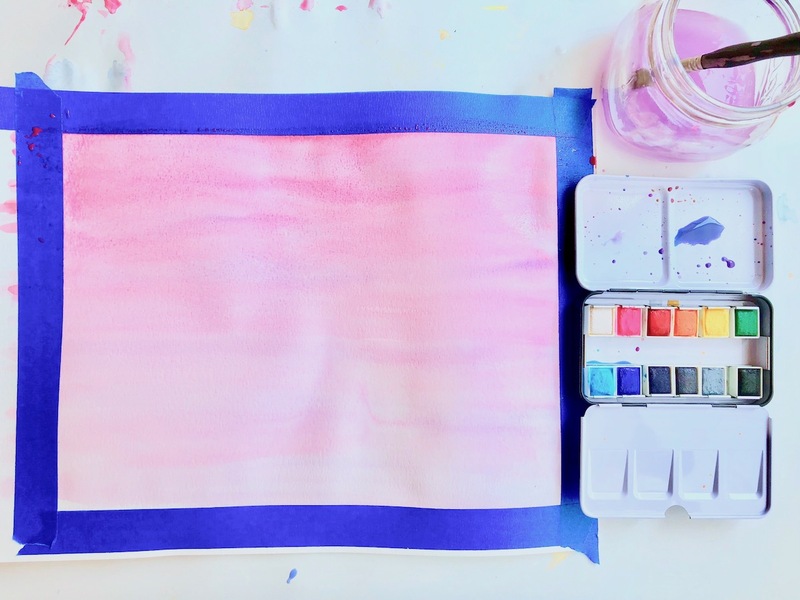 Squeeze a small amount of paint onto a tray or plate and roll it back and forth using your brayer. 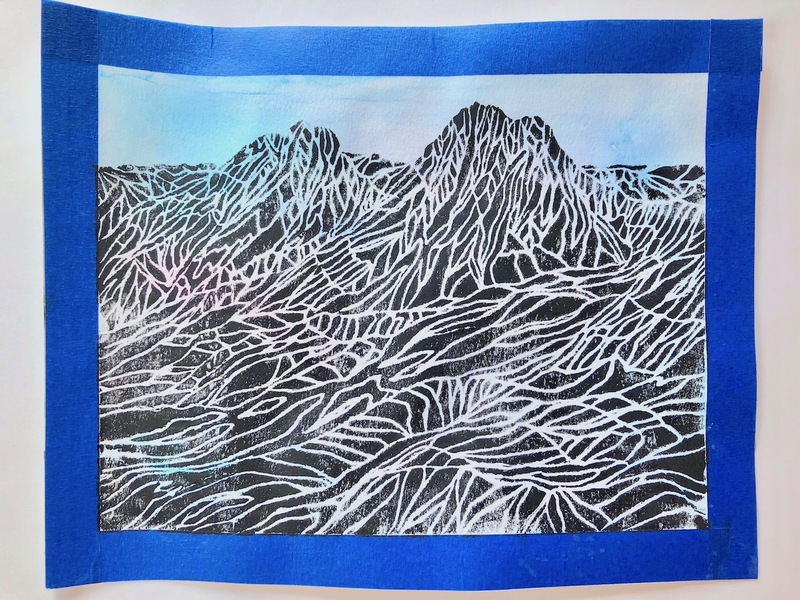 Once your brayer is evenly coated with paint, roll it over the Scratch Foam. 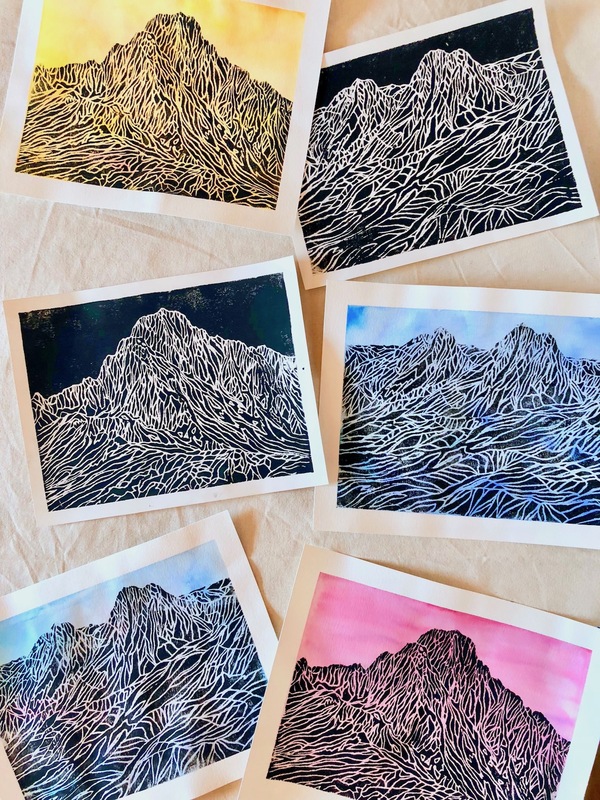 When working with a large group of children I usually show the printmaking process first and set out papers and a few trays of paint with brayers for printing. 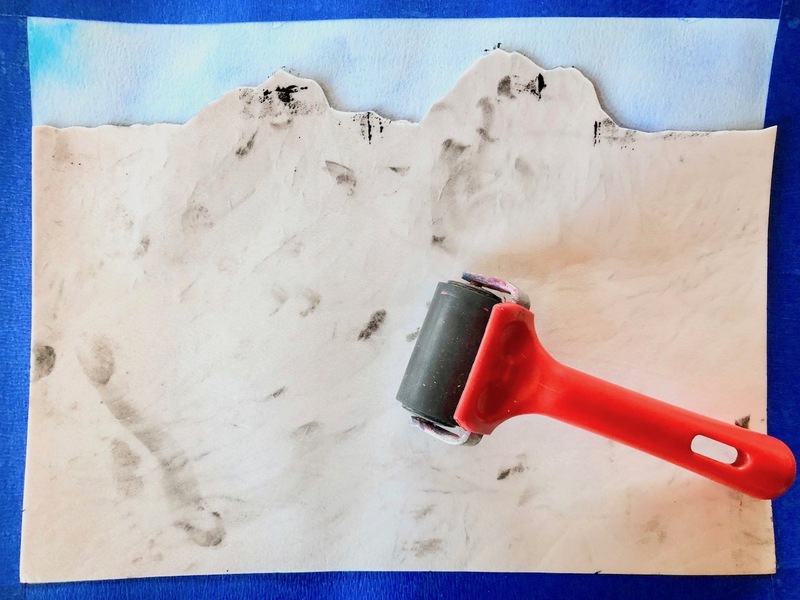 Position your Scratch Foam over a piece of paper and press down firmly to print. 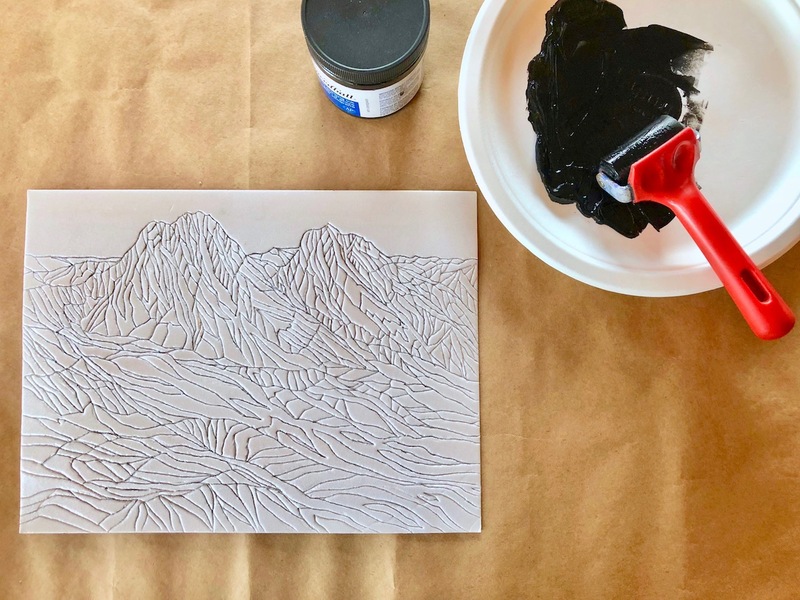 Gently rub over the foam with your fingers (or another, clean brayer) to transfer your design onto the paper. 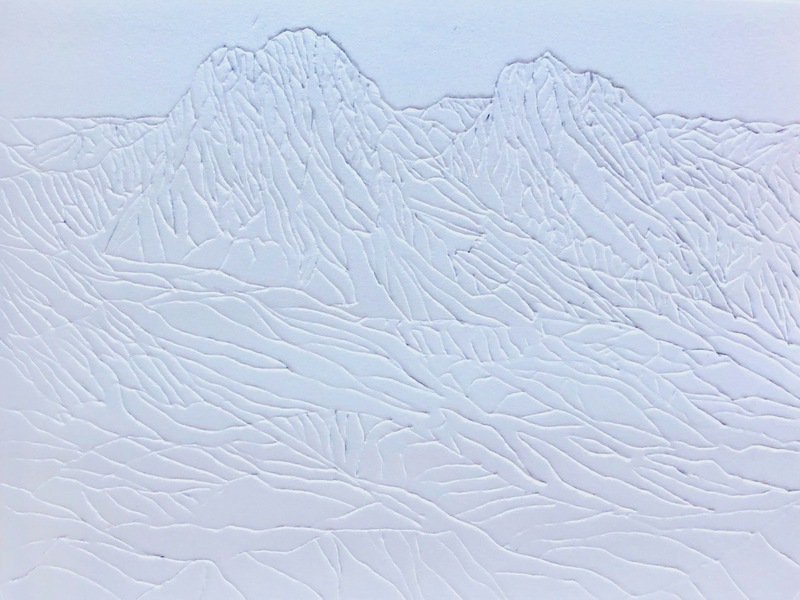 You can also position your paper over the foam, press down and rub over it to print. 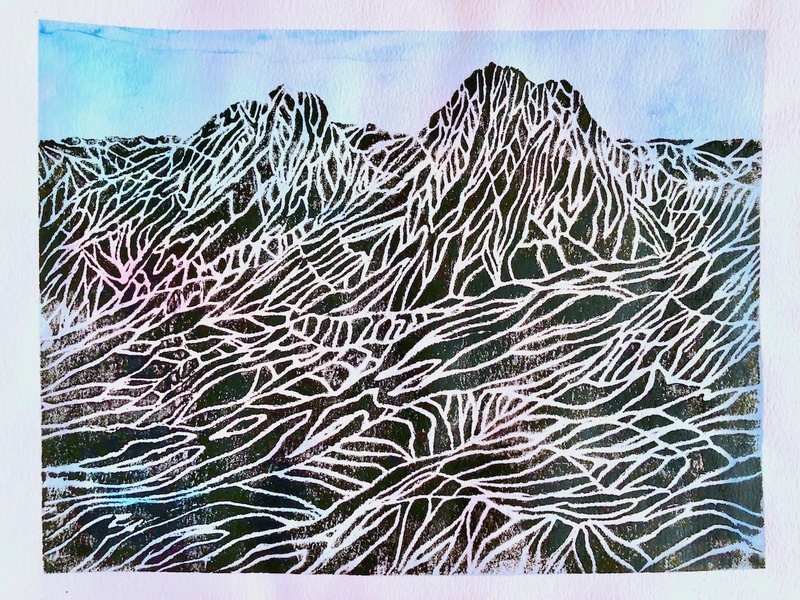 Pull up the paper to reveal your print. 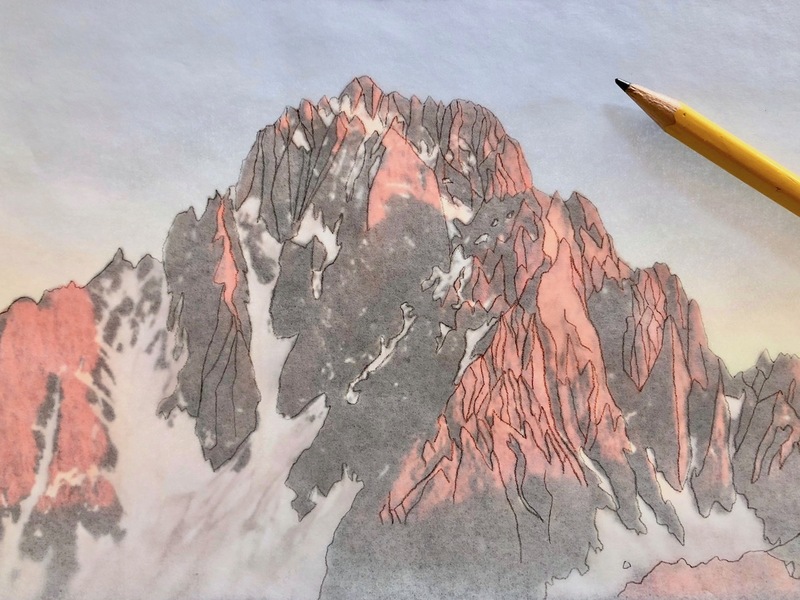 Before printing on your watercolor papers wash the Scratch Foam, dab it dry with a kitchen paper towel and cut off the top section of sky for the watercolors to show. 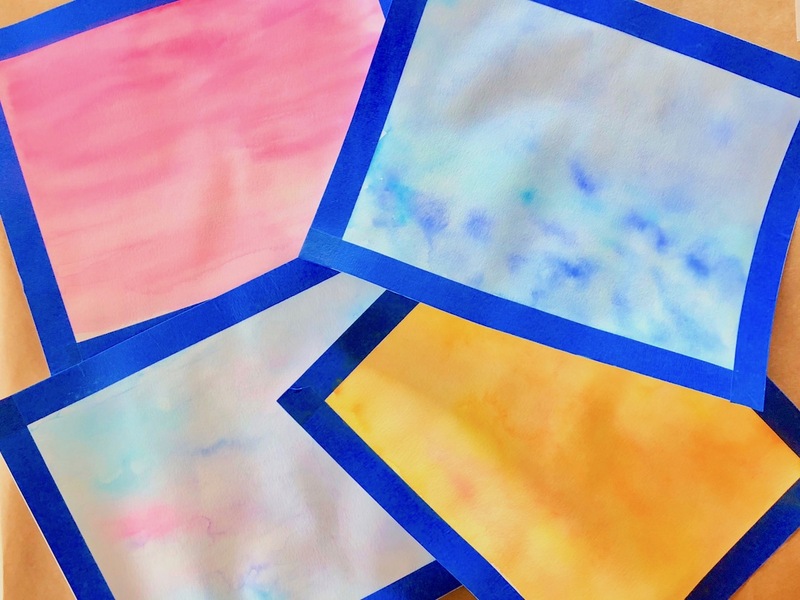 Print and repeat as often as you like (or until you run out of colored paper).